I am still working with the beets that I bought from the farmers’ market last Saturday. 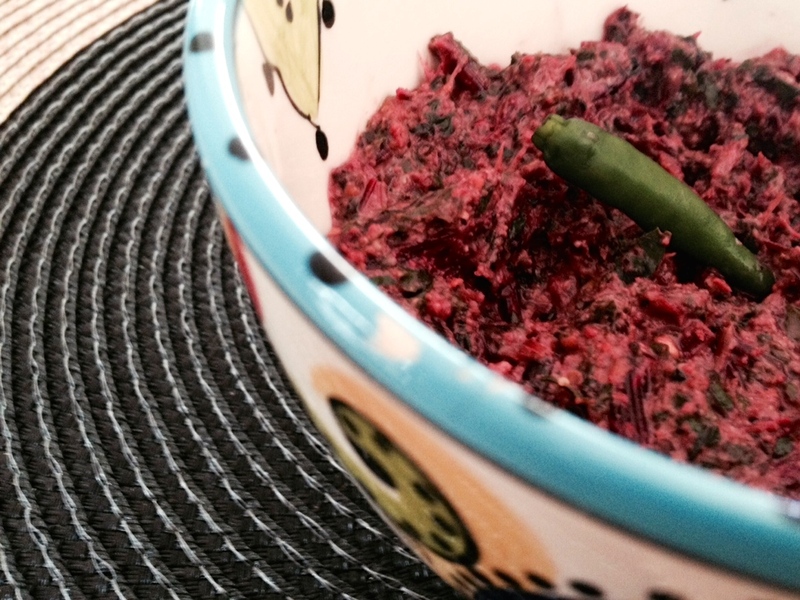 My focus this time was on the beet greens, which I have always thrown away until yesterday. I read online that beet greens are packed with vitamins A, B6, C and K along with antioxidants and fibre. So I chopped the greens, stem and all, and sautéed it in olive oil that was flavored with a grated garlic clove and hot green chili. I added salt along with two teaspoons of ground poppy seeds and a teaspoon of ground mustard seeds. My husband’s discarded Krups coffee grinder always comes in handy when I need to grind spices. I cooked this for a while and added about half a cup of water during the process. Once the water evaporated I turned the stove off and let it cool. Then I blended the concoction in my mini food chopper. I served this with basmati rice; this experimental recipe is a keeper. The use of shorshe (mustard)-posto (poppy) combo in a recipe is unique to Bengali cooking, I think .The addition of mustard introduced a distinctive pungent taste –– highly desirable to a Bengali palate –– to the greens. The use of poppy seeds gave the dish a creamy texture and of course it had that gorgeous ruby color from the stems. Categories: Vegetarian | Tags: beet greens, beet greens indian recipe, beet greens with mustard, beet greens with posto, beet tops, cooking with beet greens, healthy beet greens, how to use beet greens, indian recipe beet greens | Permalink. Yes, I keep my beet greens too. They make one tasty stir fry. I like your recipe, with poppy seeds. Will give it a try. Thanks, it’s the first time I tried them and loved it! An ineetliglnt point of view, well expressed! Thanks! I would love to hear more about this intriguing mustard-poppy combination. Knowing Bengalis, I suppose there are some good fish recipes with that also? I will definitely write a post about the use of mustard-poppy combo in Bengali cuisine. And you are absolutely right we use this combo to dish out fish recipes as well. But there are a lot of Bengali fish delicacies where we use just mustard seed paste. For the beet greens I used white poppy seeds, which is mainly used in Bengali cuisine. Also, not sure if you used black poppy or white poppy…or if it matters.